MIMIC COMPONENTS have introduced a convenient and compact audio-visual alarm that combines a super-bright 20mm LED and a penetrating sounder in a convenient wall mount box. Units are available in surface mount box (as per diag.). Custom units can be made for special requirements with silk-screened or engraved text can be supplied. 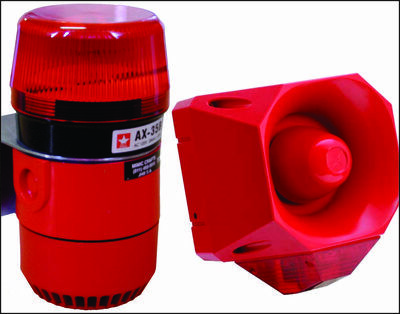 • 12V, 24V DC or 220V AC. • Super-Red 20mm dome led (Yellow or Green also available - The only approved LED for internal use by the Free State Province).